“Heading South” is an SSCA project conceived by Commodore Mary Verlaque. The concept is to facilitate a series of informal gatherings, initially focused on the US East Coast, to share knowledge between those who have gone before and those who follow in their wake. The concept is equally applicable to those heading South along the US West Coast, Europeans heading from Continental Europe or the UK to the Caribbean, or those crossing the Pacific. Anyone adapting this material for their plans is asked to send the adaptations to SSCA Homebase at office@ssca.org, so it can be shared with others. “Heading South” is a project geared to address SSCA priorities for promoting good seamanship and mentoring new cruisers. Past Board member Commodore Mary Verlaque and her husband Christian organized a series of sessions during their cruises along the US East Coast on I Wanda. SSCA suggests promoting planned events in the SSCA Bulletin, on the SSCA website, and on appropriate various cruisers’ VHF and HF/SSB radio nets to encourage folks planning to head South from Canada, New England and the Great Lakes regions towards Florida, the Bahamas, and the Caribbean to participate. There is nothing magic about “South” – whatever direction a cruiser’s planned itinerary takes him or her, the same concept will work. 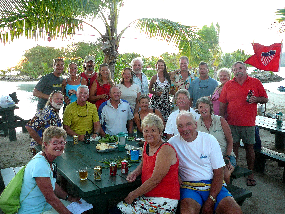 The idea is to make these gatherings informal and easy so that they may be replicated in other regions and carried on by other experienced SSCA members who are interested in sharing their cruising knowledge and experience with those who are just getting started. Cruisers helping cruisers is a core value of SSCA. After you have cruised for a time, you realize there are places where cruisers gather and mingle for a time before heading on. Along the US East Coast these places include Maine, Rhode Island and Long Island Sound, the Chesapeake Bay, the Beaufort NC area of the Outer Banks, St Mary’s GA, Vero Beach FL, and various other areas in southeast Florida where cruisers congregate to stage their passages towards the Bahamas and the eastern and western Caribbean. The key to “Heading South” gatherings is having someone with experience willing to spend a little time to plan a location and time and to make sure that the facilities can accommodate a small group (20 to 30 is common) in various weather conditions (or have a rain date). Gatherings have been held at picnic tables in the park, on the grass after a potluck, at a dinghy raft-up, and in libraries and watering holes. Each has advantages and disadvantages but you want the location to be easy for boaters to find and reach. Supportive administration is a big help! Noise in both outdoor and indoor locations can be a challenge. Having tables to write and display charts on is an advantage. How Do We Promote Gatherings? With advanced notice your gathering can be promoted in the SSCA Bulletin, in the Coconut Telegraph e-mails, the SSCA Forum, and on radio nets. Contact the Editor at editor@ssca.org early to discuss the publishing deadlines. Broad promotion has been very successful in the past. Most important is getting the word out on VHF, HF/SSB and ham radio nets. Since these are free events that are open to anyone, you will find enthusiastic willingness from the net controllers in promoting them. While it is SSCA that started the efforts and while we hope that participants will see the benefits in our organization and join if they are not now members, we do have a vested interest in having all cruisers develop and exercise good seamanship, so the sharing of our expertise is done freely. Contact experienced friends you know will be in the area and encourage them to attend and to invite any new cruisers who might be there. You can dinghy around the anchorage to introduce yourselves and to invite participation. SSCA Homebase can provide printed applications and even burgees to support “Heading South” events. Again, contact Homebase at office@ssca.org for guidance and support. The important thing to remember in a "Heading South" gathering is to allow the new cruisers to ask questions that are of concern to them. By asking at the start who is new to cruising and who has done the trip already, you will have a feel for your group. There will also be topics that the experienced cruiser thinks should be covered. It is fine to provide a brief introduction covering why you are doing this and why SSCA thinks it is so important for cruisers to share information and experience. You can highlight issues concerning the regions that lie ahead and offer more details. It is important, however, to keep the flow of information back and forth, to allow the new cruisers to ask the questions they have and for the experienced cruisers to contribute answers. The organizer is a moderator more than a lecturer. While it is fine to answer questions, it is much better for answers to come from experienced cruisers in the group. Let’s be very clear: the fewer questions answered by the moderator, the more successful the event will be. It is important to stress that there is often more than one good way of doing things. Ask for input from other experienced cruisers. If you have a sign in sheet that includes an e-mail address, you can follow up with each participant to thank them for coming and to offer assistance with follow-up questions they may have. If you won’t have tables, you will need a clip board or something to write on. A follow-up e-mail to each participant allows people to develop relationships based on the discussion that will contribute to the reputation of “Heading South” and SSCA. Encourage the experienced participants to consider organizing their own gathering down the road or a gathering concerning an area they are very familiar with. These gatherings are very easy to organize, fun to conduct and very rewarding to those who are interested in mentoring the next generation of cruisers. For a sample promotion and outline for a "Heading South" gathering, see Sample.